This year’s Anime Midwest took place in Rosemont, IL from July 8-10, 2016. We shared a city and convention center with another convention. I addressed the fact that there was another convention back in May of 2016, taking note that we would be hiring a significant amount of extra security as a result. We received numerous NUMEROUS complaints about the other convention happening. The below image is just a few of these complaints. In my most recent post, I write in depth about many of the reasons for increased security – briefly mentioning the other convention as well, as it had been rather thoroughly covered and explained in my earlier post. And, in our increased security, we made the right decision. See why below. On Friday we checked all lobbies and entrances to the hotel for badges or room keys, but later Friday afternoon our security asked a few groups of cosplayers in the lobby to go back to their rooms or leave. These attendees approached the front desk, recording their experience, and wrote about it online afterwards. However, we did have permission to control the lobbies. But – seeing that we did not want to inconvenience people with legitimate business in the hotel, we revised our policy that day – of our own decision – allowing anyone with a keycard or badge in the lobbies – at most asking people to show us either. At no point did we kick anyone with keycards out of the hotel, but for a couple hours on Friday, we did ask them to return to their rooms. Cosplayers staying at any hotel in Rosemont are still financially supporting the convention through various rebates and incentives, so we would have no financial reason to ask paying hotel guests to leave. For a brief period while we were working our our security policy, we did not badge check or room check the lobbies. Very shortly after we relaxed our security, someone in Rosemont, potentially with a hotel room at the Hyatt, distributed highly pornographic material in all the public bathrooms and lobbies. The performers advertised both appear in Google results for their name + the name of the other convention, and appear to have performed at the other convention in the past. My blog is intended generally for all ages, so this may be hard to describe, but in the unblurred image, the woman in the bottom right photo is clearly performing a sexual act on a man. The man’s anatomy is clearly visible as well. Our security staff immediately collected these as fast as we could, and we wound up with a very large stack of these flyers. Fortunately, there were relatively few other incidents over the weekend – which I attribute to our extra security. We had a few complaints of harassment from people who did not have badges and still managed to get in, and apparently even one report of someone pretending to be ME catcalling someone dressed in drag. Which is… strange. Despite our best intentions, we can’t help being questioned by people on the internet. As best evidenced by past stories about a lawsuit we have launched against an online blogger, blogging is a terribly, terribly poor source of information. The standards of journalism are not the same – and often sensationalism or “breaking” a story rules the day, with only a surface level account of the details. They missed the fact that I had already stated in a previous blog post that the first reason, from two months before the convention, was because of another convention going on. They write “On a few occasions panel rooms for the two cons were next to each other.” – We had a separate ballroom, divided into sections, for our events. There should have at no point been events next to each other. If you have information stating otherwise, let me know, because this is out of left field. 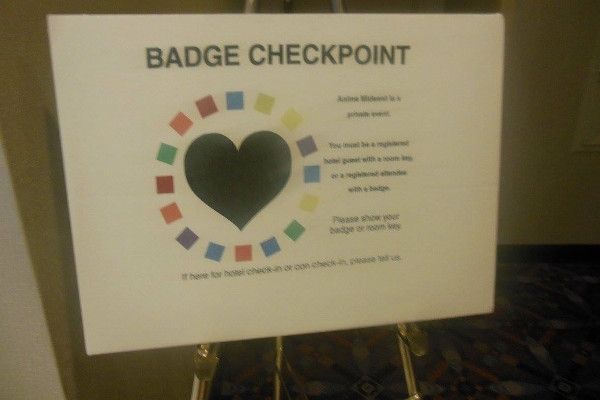 Below is an image of the badge checkpoint sign that was at the convention center and front entrance. There were different signs for badge-only areas, which were never mixed up. I only wish online bloggers would take the time to contact us for the little details – because we acknowledge there is a fine line between being “badge nazis”, and keeping our attendees safe. 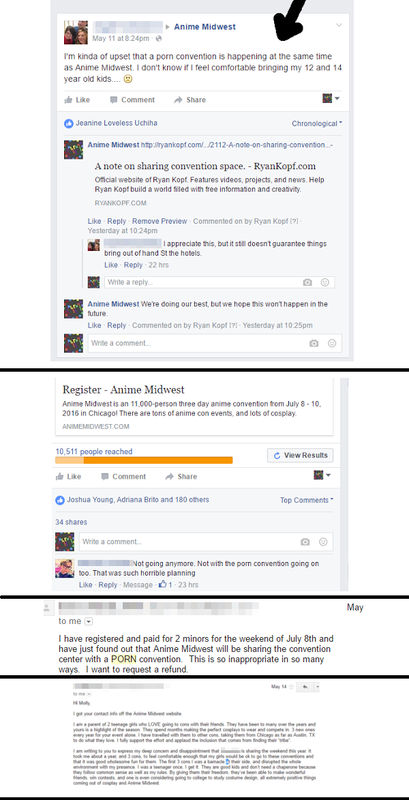 We don’t mind acknowledging our occasional missteps, and we’re certainly happy that people are spreading the word that Anime Midwest has lots of security now. I want to run a safe convention for my attendees. Of course, there are a few bloggers that are going to say “that’s impossible,” who I encourage to view my transparency center, as there’s been an ongoing smear campaign against me. Look, we’ve sometimes messed up. We’ve been disorganized and bad a couple times in the past. Not this time. I plan to run a convention that is safe for my paying customers. People are likely to keep writing. We may continue to answer. But as far as I’m concerned, we’ve kept 12,500+ people safe, and this story is done.